I'm addicted to the figure skating anime "Yuri on Ice", y'all. It's got the sweetest romance on the planet! And so much feel-good-ness flowing through it that you can't help feeling great and hopeful after watching (along with craving the next episode so hard!). 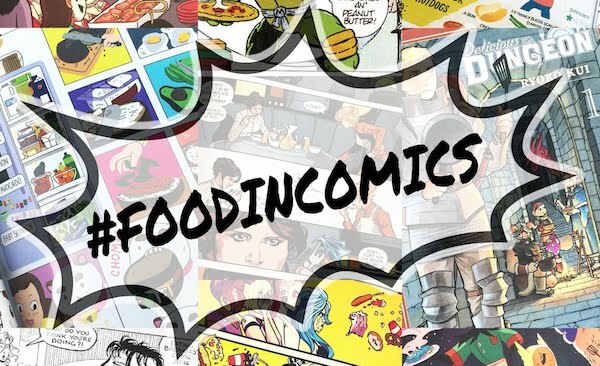 Food features heavily in the show, especially as symbolism. 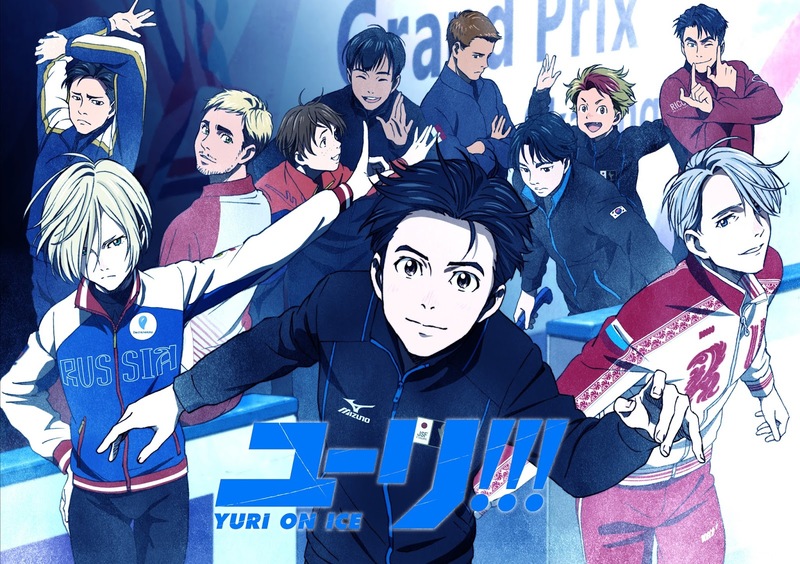 The first episode establishes the story and character-significance of the traditional Japanese comfort food katsudon, or pork cutlet bowl for the main character Japanese ice skater Yuri Katsuki, and in extension, for his new coach and prior ice skating legend Victor Nikiforov. 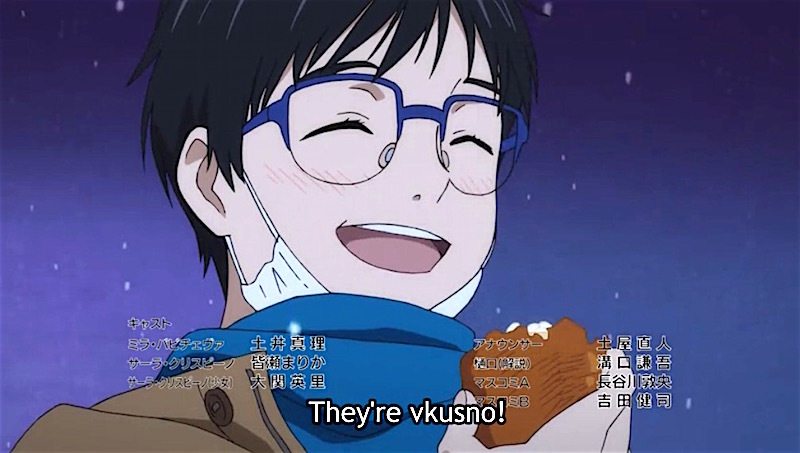 Another character is introduced, also named Yuri, who is from Russia (same as Victor), and we learn that he loves the traditional Russian comfort food piroshki because his grandfather, whom he loved most in the world, makes them for him (in-fact, the first YOI episode is partially-titled "Easy as Pirozhki!!". In episode 8, after taking a bite of a piroshki his grandfather made him, this Yuri (Yuri Plisetsky) asks if his grandfather is familiar with katsudon, because Yuri tried it while visiting Japan and really liked it. In episode 9, Yuri's grandfather gives him another bag of homemade piroshki, and when Yuri P. (nicknamed Yurio in the series) bites into it he is beyond surprised. "There's pork cutlet, fried eggs, and white rice in here! What's with this pirozhki?!" "It's a pork cutlet bowl pirozhki! Eat them and do well in today's free skate, Yuratchka." At the end of the episode, in a rare show of camaraderie, Yurio gives the rest of his precious katsudon piroshki to Yuri K., who is extremely touched by the sentiment. Although Yurio is the character that is shown with an attachment to piroshki, I like to think that it could also represent Victor, as he is also from Russia, and the fusion of it with katsudon can symbolize the bond of Yuri K. and Victor's deepening relationship. Of course, it also symbolizes Yuri and Yurio's growing friendship/respect ;). 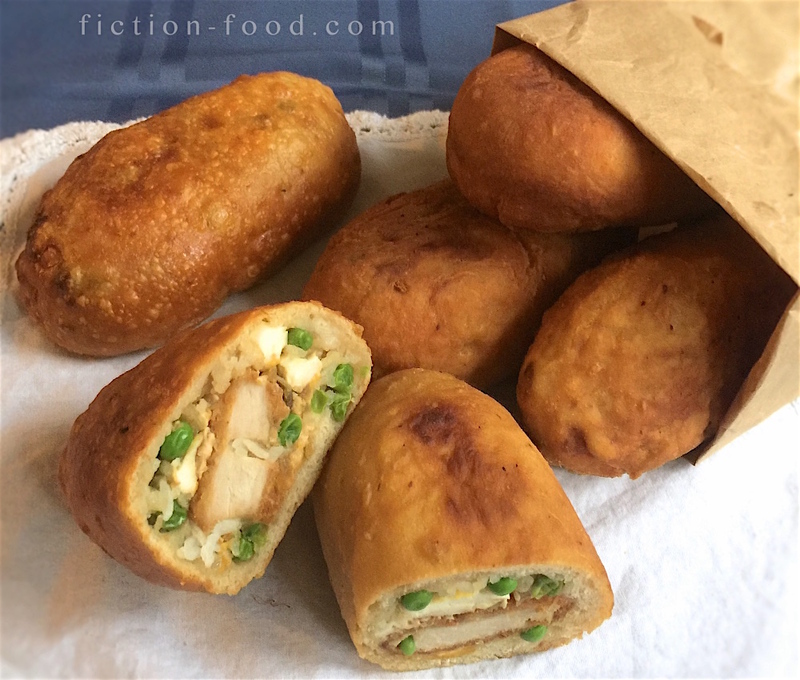 Note: I initially brainstormed katsudon sushi rolls (sans seaweed, of course) to be the filling for these piroshki (the egg, onion, & katsu pieces rolled up in the peas & rice), but upon implementation it proved to be too much rice to bite through combined with the dough of the piroshki, and also caused the piroshki to be hecka huge. You could still go this route by using less rice & flattening it more, but at that point it wouldn't be as stable a roll, and you may as well just layer it as directed below. If you did want to make filling bundles though, lay the ingredients on a large sheet of plastic wrap and roll it up tightly, then unwrap from the plastic. 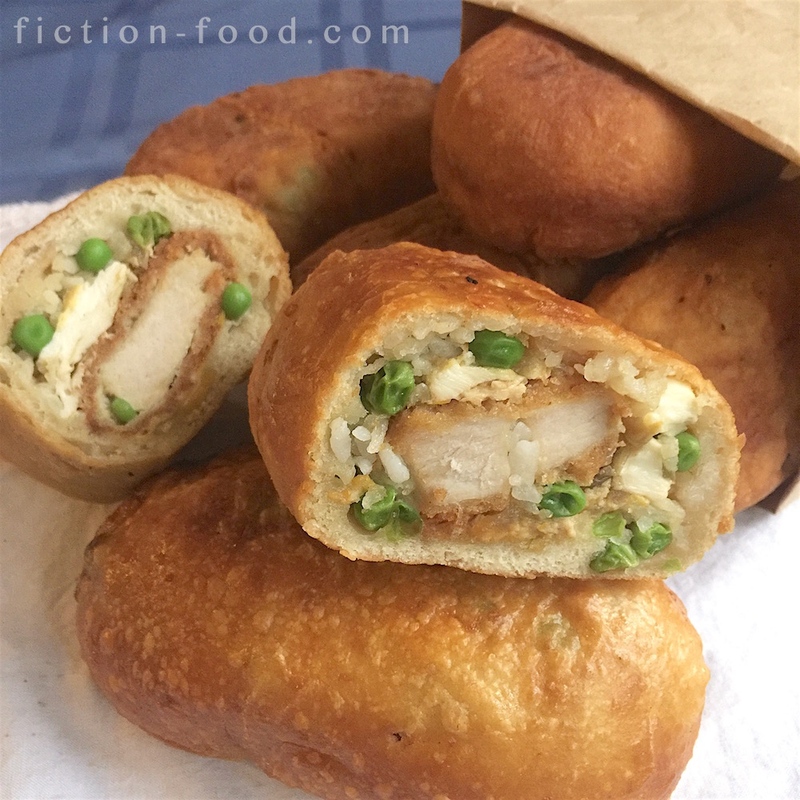 Also to note, I did bake a few of these, to see the difference, and I wasn't too keen on the texture of the bread from baking, BUT I did half bake, half deep fry a few and they were great! Haha, so random (I started baking some and after taking a bite of one I had just pulled out of the oven I was like, nope, gonna fry instead). If you want to bake them though, brush the wrapped up piroshki with an egg wash (beaten egg + 1 Tbsp. water) and bake at 375ºF for about 25 minutes, or until golden brown. If you want to be crazy and experiment like I did, bake them for about 12 minutes and then fry them in oil for a few minutes until golden brown. Piroshki dough recipe adapted from Natasha's Kitchen. 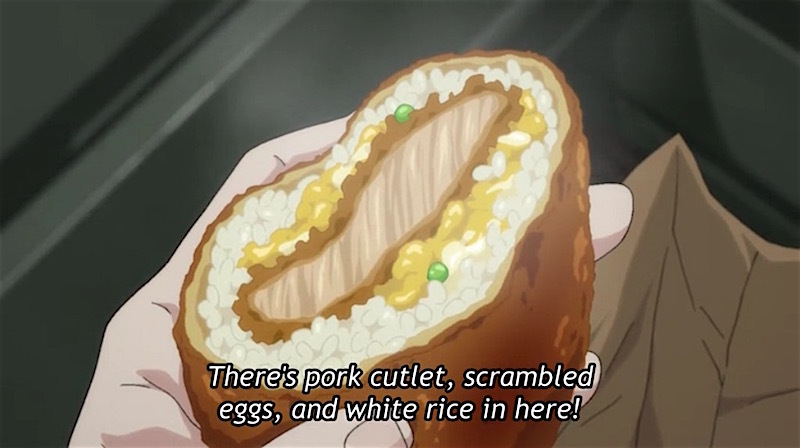 ** If you simply want to make Yuri K's katsudon (pork cutlet bowl), click here for the recipe! 1. Piroshki Dough: Put the yeast in a large mixing bowl. Combine the water & milk & heat for about 45 seconds or so in the microwave to make it nice & warm. Pour this mixture over the yeast, sprinkle in a little sugar, & let sit for about 15 minutes to foam up. Add in the Tbsp. of oil, 2 tsp. sugar, salt, & flour. Mix on low with a dough hook until the dough comes together & is fully combined. 2. Dip your hands in flour & scrape the dough from the sides of the bowl so it's somewhat ball-ish in the center of the bowl. Cover the bowl with plastic wrap & let rise in a warm place for about an hour. (I turned my oven to "warm" for about a minute, then turned it off & closed the dough in there). Flour your hands again & scrape down the dough. Mix it on low speed again for about a minute & then cover it & rise it again in the same way for another hour. Prepare the filling during this time. 3. Tonkatsu part: In a heavy-bottomed pan, bring about 1" or so of canola oil to 350ºF. Rinse the pork & pat it dry with a paper towel. Score each piece a little with a sharp knife, & then sprinkle a little salt & pepper on both sides. Cut each cutlet in half along the length. Put the flour, beaten egg, & panko crumbs in seperate bowls. Dredge each piece of pork in flour, then dip in egg, & then coat well in panko. 4. Depending on the size of your pan, place a few breaded pork pieces in the oil at a time, making sure not to crowd (so, 2-3 pieces should be fine). Cook until deep golden brown & crispy, turning to evenly cook both sides, about 4-5 mins total (make sure the temperature in stable!). Remove the tonkatsu to a paper towel-lined wire rack. 5. Katsudon part: In a small pan, combine 1/4 cup of the dashi stock, 1 Tbsp. of mirin, 1/2 Tbsp. soy sauce, & 1/2 Tbsp. 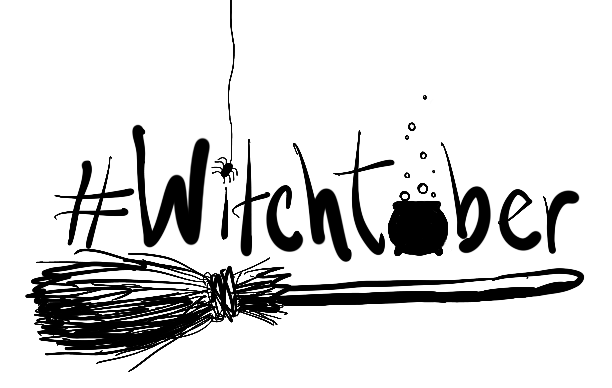 sugar with about 1/4 of the cut onions, & bring to a boil so that the onions get tender, stirring occasionally. Cut each tonkatsu piece into a few horizontal strips, keeping the strips of each piece together (you don't need to cut them completely through like with regular katsudon, but it's not a big deal if you do). Place 2 of the cut tonkatsu into the pan & break an egg over each. Cover the pan with a lid & let cook until the eggs are set. Remove to a large plate. Repeat these steps (combining the sauce ingredients w/ onions, cutting the tonkatsu, cooking with egg) until each tonkatsu has egg & onion. If there is any sauce/liquid from the pan throughout the process, reserve it in a little measuring cup. 6. Making the Piroshki: Heat about 1 1/2" of oil in the heavy-bottomed pan to 350ºF (just add a little more oil to the pan you used earlier, after scooping out any panic crumbs). Heavily flour your hands & a flat work surface. Pull off about a palm-sized portion of dough & flatten it on the work surface, in the flour. Roll the dough to about 4 1/2" x 6" (doesn't need to be exact, but you want it flat, without being so thin that it tears). 7. Place about a Tbsp. worth of cooked rice down the center, staying away from the edges. Place a bunch of frozen peas on the rice (or you could do peas first & then rice), then lay on an egg & onion covered katsu piece (you want the katsu to be about 1 1/2" wide x about 3" - 3 1/2" long. If the piece is too big, just trim it & use the extra pieces for another piroshki). Put more onions & egg on if needed & put about another Tbsp. of rice on top with some more peas. If you have any reserve sauce/liquid, pour a little bit on. Draw up the edges of the dough & pinch them to close. Carefully pick up the piroshki & roll it in your hands to smooth it out & shape it basically like a potato. Repeat this process until all of the katsu et al has been bundled up in piroshki dough. 8. Lower a piroshki or two (depending on the size of your pan) into the hot oil & cook until a deep golden brown, turning to evenly cook both sides (keeping an eye on the oil temperature–you want it at 350ºF). Remove to a paper towel-lined rack & let cool until able to handle comfortably. Serve as is or with a little tonkatsu sauce on the side for dipping (mixed with a little spicy sauce if you prefer that!). what is the serving amount? What is the correct interpretation? aaaa i know im super late but im SO EXCITED TO TRY THIS?????? ive made katsudon before but i didn't think i would find any for these but OH MY GOD these look so good!!!!! !